As the media landscape continues to shift and buckle under the stress of digital disruption, the marketplace has started to look like a little like a barbell. On one end are large players, seeking massive scale at any cost. On the other end are small sites trying to build a business by being hyper-focused on a specific audience. The Information, a technology-news site started by former Wall Street Journal reporter Jessica Lessin in 2013, clearly falls into the latter category. Until recently there were only six writers, and the site posts one or two stories a day, instead of the hundreds that larger sites publish. Unlike BuzzFeed or the New York Times, where readership is measured in the hundreds of millions, The Information’s audience is measured in the single-digit thousands. But Lessin said in a recent interview with Fortune that her company has proven there is a profitable business to be built even at that scale, and she is busy expanding its reach into new markets. 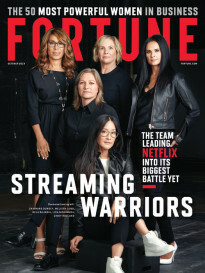 The key to her site’s success, The Information founder said, is that it isn’t shackled to the advertising treadmill the way most traditional media companies are—something that requires the pursuit of massive scale, and prioritizes traffic and clicks above everything else. The Information carries no ads and likely won’t for the foreseeable future, Lessin says. Instead, the company relies solely on the $399 per year that each subscriber pays—roughly equivalent to the price of an annual subscription to her former workplace. The site does events, but they are small networking events for subscribers, not money-generating efforts. Lessin, who has self-funded the site from inception, said it now has 18 staff—twice what it had last year. (The company’s subscriber base has also doubled in that time, she said, although she wouldn’t provide an exact figure.) That number includes a new hire, former Wall Street Journal and Bloomberg reporter Shai Oster, who will be opening a Hong Kong bureau. In addition to expanding into new markets, The Information has also created an advisory board that features heavyweights from the worlds of media and finance, including legendary venture capitalist John Doerr, Politico co-founder Jim VandeHei, and former ProPublica CEO Paul Steiger. 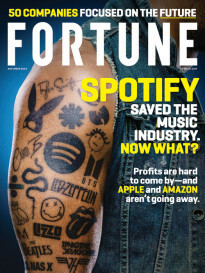 Fortune: Some media watchers say the kind of subscription-based approach taken by The Information and others is fine if you want to have a very small business, but that this kind of strategy doesn’t really scale. Lessin: I’ve never really understood that. I mean, clearly subscription-based businesses can scale—the Wall Street Journal has millions of subscribers, and on an un-discounted basis it’s about the same price as The Information. There are many examples of successful subscription-based media companies that have achieved significant scale. I think a subscription model is way more scalable than building a media company based around events where tickets cost thousands of dollars. You mentioned how you pay close attention to what your readers are looking at, in terms of figuring out what areas you should cover. Having that kind of close relationship must be even more important when you rely 100% on subscribers to pay the bills. That’s absolutely true. I think in general, media companies have lost sight of building relationships with their end users that will bring them in directly, as opposed to just posting links on social networks and hoping people will click. I think publishers that do that are shooting themselves in the foot. Media companies in general are way too focused on being where our readers are, as opposed to being so necessary to our readers that they will seek us out. So you’re not a big believer in the distributed model of news, where sites rely on Facebook and other social networks to reach their readers? I’m worried that media companies are spending way too much time and energy on those platforms. It’s just like back in the day when Google News first came out, and publishers were falling all over themselves trying to get preferential treatment from Google (googl). Facebook (fb) has actually become very clear about how they prioritize, and what’s driving engagement isn’t that piece in The Atlantic or whatever, it’s my family and their photos. What baffles me is that the platforms are coming clean a little bit, but media companies aren’t changing their approach. But do you take advantage of Facebook and Twitter (twtr) and other platforms for your journalism? One of the hard parts about a site with a hard paywall like The Information is letting people know what you have. I realize that subscription and advertising businesses are very different, and I’m not saying that you should never use platforms, but I think you have to play to your strengths, and gaming the latest platform’s algorithm is never going to be that strength. Most of our growth is organic and word of mouth, and we are building out traditional marketing channels, we use email and social. I find some value in social platforms for that, but it’s very different from putting multiple engineers on an Instant Articles project and just focusing all your time and energy on that. One of the initial criticisms of sites like The Information was that since they would likely have a small group of paying subscribers from the executive ranks of large tech companies, they might cater their reporting to that group. Any thoughts on that? I have always thought that the way to get the attention of those in the industry isn’t to butter them up or write puff pieces. It’s to write the smart stories, the ones that tell them something they don’t already know. You’re not going to appeal to them by doing patronizing or softball stories. We do stories that are way tougher than the vast majority of our competitors, if you look at our coverage of Nest or Jawbone or even Facebook.